Well it is that time of year again. No I don't mean your annual teeth cleaning, although that's not a bad idea. I am talking fall foliage road trip! If you read my blog (you do read my blog, don't you? ), then you know that this is the time of year that I pay some neighborhood kid to rake my lawn and hit the road for this annual display of color, compliments of Mother Nature. Last year I learned exactly why the leaves change color, and would like to share that with you again. Those brilliant reds, oranges, and yellows are actually present in the leaves all year long. That's right, the carotenoids in leaves are responsible for yellows, oranges, and browns; while anthocyanins provide the reds and purples. But the chlorophyll used in photosynthesis by leaf-bearing trees has a dominant green pigment to it, obscuring the others. As the nights grow longer and cooler, chlorophyll production slows and the hidden colors are revealed; sort of like watching Paula Deen remove her face makeup. Anywho, I've got a route I take each year, starting way up north in New England and finishing in the Great Smokey Mountains of Tennessee. I rent timeshares at some great resorts along the way, and catch a bit of the local flavor from the great towns and villages as I go. As you may have heard, there was some pretty whacky weather this summer and fall in both the north- and southeast, and it has had an effect on the color. 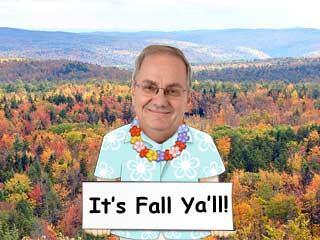 Most of Maine has already seen its peak color, and if it is any indicator, this is not going to be a "super peak" year. More likely, you'll see trees that have lost all their leaves, trees in full color, and some that have yet to start changing. It's still gorgeous, and well worth the trip. Heck, I'd go to Vermont just for the maple syrup and to make sure everyone was okay after the terrible flooding they had. It's easy to forget about that when there are so many other things competing for your intention. Like Paula Deen, for example. I like to throw in a stop in Beantown to get some chowdah, even if it is wicked ha'd to pa'k your ca' there. A timeshare rental at Marriott's Custom House is an excellent base for taking in all of Boston's historic sights, and getting out into the country to "peep some leaves". From there, I like to swing across Connecticut, catching more color and great antiquing along the way, and head into the Catskills region of New York. Villa Roma Resort Lodges in Callicoon provides me a front row seat for the colorful display, and is just two hours away from the Big Apple, should I decide to take in some "people-peeping". You know they've got a Naked Cowboy down there in Gotham? They've got everything in New York. You might just want to keep north of Wall Street for the time being, particularly if you are involved in banking or finance in any capacity. Next up I like to hit Depuy Village at Shawnee Resort, in the Delaware Valley between New Jersey and Pennsylvania. I always seem to hit great color in this stretch of the Appalachians. Of course I have to make my yearly pilgrimage to the Crayola crayon factory in nearby Easton, PA, and the Hershey Chocolate factory, which isn't nearby at all. But when you start talking crayons and chocolate bars, reason just doesn't factor into the equation. Then I turn it south and cross the Mason-Dixon line into the Old Dominion State of Virginia. The Summit at Massanutten puts you in the heart of Virginia's Shenandoah Valley and some spectacular fall vistas along Skyline Drive and the Blueridge Parkway. And if the America Civil War is your thing, there are fourteen battlefields in this region alone. Most of Thomas "Stonewall" Jackson is buried in his hometown of Lexington, VA; a lovely little town you should definitely check out. His right arm, which was blown off by his own troops, is buried in Orange County, VA, about 2 hours away. Seems like a bit of a morbid detour, but to each their own. Finally, I wrap it up at the MountainLoft Resort in Gatlinburg, TN. This quiet hillside community is nestled in the Great Smokey Mountains, and I can't think of any better place to wrap up a fall foliage trip. Of course if I get a hankerin' for some good ole country music, spandex, and rhinestones - which I am wont to do - I can head on over to Dollywood. That's right, Dolly Parton's got her own theme park in nearby Pigeon Forge, the town of her birth. How long before Paula Deen gets her own theme park do you think? Can you say butter flume and bacon bumper cars, Ya'll?